Birthday gifts with Sand Sign can spread your gifting experience. Make this celebration filled by positive emotions and warmness of your feelings. You can make personal birthday gift for her or for him. The sand art gifts will add the colors of original for Birthday party. We suggest you unique birthday gift ideas that will bring happiness to birthday person. You can make the best of presents and decorate your wishes with flowers or seashells. You can send your words around the world – it will be exclusive birthday gift. Make gift from your heart! We already made happy lots of visitors of our site! You will get beautiful qualitative pictures, fascinating birthday gift video. 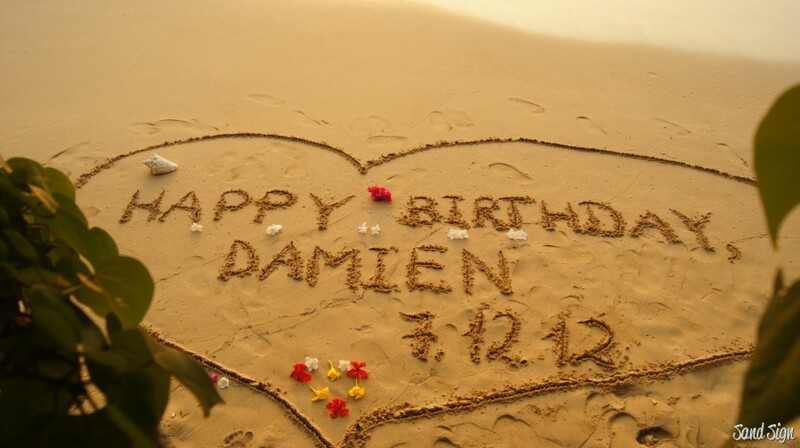 You can decorate your birthday greeting on the sand with flowers or add seashells as well. We garantee high quality of acting! It will be the best birthday gift! Wish you all the best!